For some, the end of summer is a depressing time. If you’re like me, you associate summer with youth, that unbearably exciting season of limitless play. Even as an adult, the return of school in September inspires within me a strange, sad mopiness. If I’m not careful, a mere errant wind, hauling the smell of scorched leaves, might crush me. And yet, there is always that day, that inevitably gorgeous day on the nib of summer and fall, when, browsing the local market, I come upon the season’s first butternut squash; when, holding the squash in my hand, I recall the soulful thrill of butternut squash soup. To me, a seasonal soup is the absolute best way to eat the season. 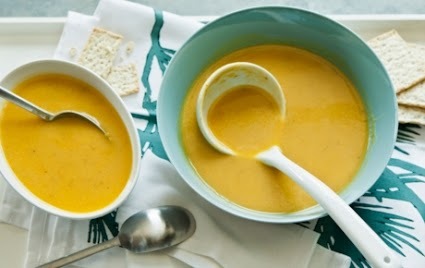 A light Gazpacho or Carrot & Almond soup is well-suited for the spring and summer months, but the cooler months compel opulent, humble soups: Butternut Squash Soup (recipe below), Chickpea Soup with Saffron and Mushroom-Almond Garnish, or Sweet Potato and Fennel Soup with Saffron. Soup also offers a template for combining ingredients tailored for certain health conditions or body constitutions. A light miso soup offers refreshment to a sluggish constitution. Butternut squash soup, on the other hand, soothes a cool constitution like my own. Most soup recipes are easily adaptable. With practice, you can tailor your soup to you and your family’s distinct emotional and nutritional needs. I add turmeric to my butternut squash soup, for example, because it lends an emotionally uplifting, vibrant color to the dish; but turmeric is also autoimmune supportive. Additionally, instead of olive oil, I add extra virgin coconut oil to my soup—not only for its fragrance, which reminds me of a certain surf shop in Stone Harbor, but because it is rich in antifungal, antibacterial, antiviral lauric acid. In the Philadelphia region, autumn is often dry, cool, and windy. After the warmth of the summer, your body might feel this new, cool weather as an imbalance. In Eastern medicine, doctors prescribe warming foods to settle this type of imbalance. Depending upon your constitution you might need more or less warming food, however most people benefit from including a majority of warming foods in the cool months. Warming cooking methods, then, might include nourishing long-cooked soups like those mentioned above, stews, hearty gratins like Kripalu’s Squash-A-Roni (recipe below), or a rich long-simmered dessert like Coconut Rice Pudding. Perhaps the easiest way to add warmth to your food is the addition of high-quality herbs or spices. Herbs and spices are among the healthiest foods on the planet; dense in vitamins and minerals, herbs and spices act as thermogenic foods, increasing your metabolism and stimulating warmth in the body. Many herbs and spices rate ridiculously high on the ORAC scale, the standardized method for measuring the antioxidant capacity of foods. As such, herbs and spices may combat some of harmful products initiated by the cooking process. Check out my recipe for Cinnamon, Paprika and Thyme Rubbed Chicken (recipe below). And check out my adaptation of Peter Berley's Moroccan Chermoula Tempeh--the greatest tempeh recipe of all time. Herbs and spices can be added to any number of dishes for flavor, warmth, and astonishing health benefits. Healthy, warming herbs include oregano, thyme, and sage; the most potently healthy spices include turmeric, cinnamon, cloves, and nutmeg—all suitable for autumn recipes. If you cook with these thoughts in mind, you’ll learn to tailor your meal to the prevailing weather, as well as the moods and dispositions of the people you’re cooking for. However, remember the golden rule of cooking: culture and joy must reign. Any addition to any recipe should make cultural and culinary sense; likewise, additional ingredients should not compromise the joy of eating. Turmeric, for example, would be an atrocious addition to Gazpacho. And I would never use extra virgin coconut oil for my Tuscan Bean Soup. Recipes that call for misguided “substitutions” miss a major point of cooking: food is not merely nutrition; it is a powerful FORCE that connect us our environment, heritage, and culture. When I make this soup, I add the seeds from the butternut squash to a cheesecloth bundle, with a cinnamon stick, bay leaf, and three whole cloves. Heat oil in a large pot over medium heat. Add onion, garlic, and a pinch of salt. Cover the pot, reduce the heat to low and stew gently for 10-12 minutes. Add turmeric, raise heat to medium, and cook for 1 minute. Add butternut squash and stock; bring to a boil. Cover, reduce heat to medium-low and simmer gently for 25-30 minutes, until squash is soft. When cool, blend the soup in batches. Add coconut milk, if desired, warm, and season to taste with salt and pepper. In a large, ovenproof skillet, warm 1 tablespoon olive oil over medium heat. Add the onion and sauté, stirring frequently, until translucent, 5-7 minutes. Add the squash, ½ cup water, and ½ teaspoon sea salt. Cover and cook for until squash is soft, 15-20 minutes. Meanwhile, in a large saucepan, cook the pasta in boiling water until tender, but still firm. Preheat oven to 375 degrees. In a small bowl, stir together the tahini, miso, vinegar, and tamari. Add this mixture to the squash and mix until creamy. Add the reserved pasta, remaining oil, pecans, and thyme. Top with bread crumbs and bake for 20 minutes. Serve immediately. Dissolve the salt and water in a gallon plastic bag. Place the chicken in the bag and brine for 1-2 hours. Meanwhile combine paprika, thyme, and cinnamon in a small bowl. Place chicken skin side down on a heavy-bottomed, oven-proof skillet. Place pan on bottom rack and roast for 18 minutes. 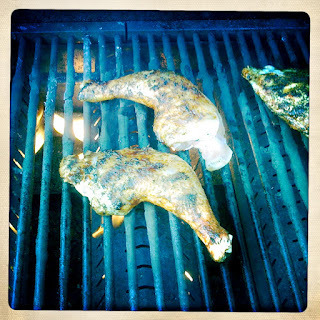 Flip chicken breasts skin side up and continue to cook until a thermometer inserted into the chicken reads 165°F, 6-10 minutes. Serve. Preheat oven to 310 degrees. Combine oil, water, lemon juice, spices, cilantro, salt, and garlic in a medium bowl and whisk well. Place tempeh cubes in a 9 inch baking pan and pour marinade over it. Cover with tin foil and bake for 60 minutes. Uncover and bake for 20 minutes, until browned.